To develop creativity and imagination through sustained activities. A variety of projects to develop students’ confidence to select, interpret and record, using an extended range of art materials, processes and practices. To provide a structured programme of activities to secure success. To learn vital Art skills whilst developing individual creativity. To enable students to discover where their strengths lie in Art and build upon them. The areas of Art sampled may include: – drawing, painting, ceramics (clay), sculpture, textiles, design, graphics and fashion. To enable students to thoroughly understand and engage in the creative process; to discover where students’ strengths and skills are in Art and Design; to enable students to produce work that they enjoy and are proud of; to enable students to become independent and imaginative artists who fulfil the requirements of the National Curriculum. At Key Stage 3 all students follow the same lessons, presented to children in ways appropriate to their age. There is now a rolling 3 year scheme of work. The areas of Art sampled may include: – drawing, painting, ceramics (clay), sculpture, textiles, design, graphics and fashion. A variety of projects to develop students’ confidence to select, interpret and record, using an extended range of art materials, processes and practices. 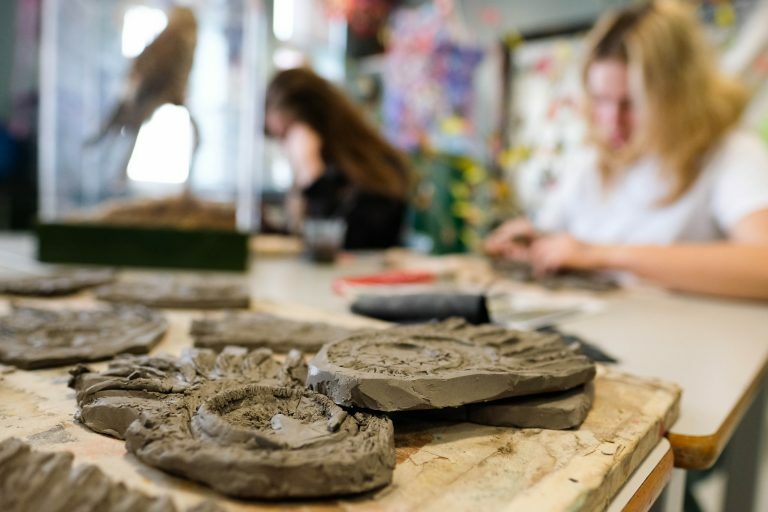 To enable students to learn vital Art skills whilst developing their individual creativity, they will discover where their strength lies in Art and build upon it. This course, which is over two years, will be highly structured and is designed to allow students to succeed. Students will experience a variety of art techniques including drawing, painting, ceramics (clay), sculpture, textiles, design, graphics and fashion. Completing unfinished work, visual research, art history. This course which is over two years will be highly structured and is designed to allow students to succeed. Students will experience a variety of art techniques including drawing, painting, ceramics (clay), sculpture, textiles, design, graphics and fashion. Students will prepare for a 10 hour exam. For more information about the Art curriculum please contact Mrs Reay.